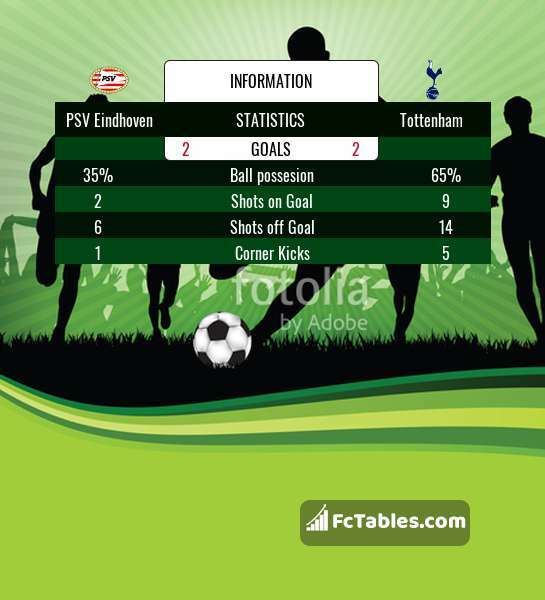 Kick off PSV Eindhoven-Tottenham in Champions League on today 16:55. Referee in the match will be Slavko Vincic. Team PSV Eindhoven currently is on lower place in table (4 position). Last 5 games (league + cup) finished balance 6 points. PSV Eindhoven did not win the match from 2 games. The most goals in Champions League for PSV Eindhoven scored: Hirving Lozano 2 goals, Luuk de Jong 1 goals, Gaston Pereiro 1 goals. Players with the most assists: Hirving Lozano 1 assists, Luuk de Jong 2 assists, Gaston Pereiro 1 assists. In PSV Eindhoven not occur in the match due to injury: Ryan Thomas. Team Tottenham is located in the middle of the table. (3 place). Tottenham in 5 last matches (league + cup) have collected0 points. The best players Tottenham in Champions League, who scored the most goals for the club: Erik Lamela 1 goals, Christian Eriksen 1 goals, Harry Kane 1 goals. Players with the most assists: Erik Lamela 2 assists. Injured players Tottenham: Danny Rose, Jan Vertonghen, Vincent Janssen, Dele Alli. Direct matches: Tottenham won more direct matches. PSV Eindhoven won 1 matches , Tottenham won 1 direct matches, was a 0 draws. In 0 matches the sum of the goals both teams was greater than 2.5 (Over 2.5), and 0 matches teams scored more than 1.5 goals (Over 1.5). In 0 matches the both teams scored a least one goal (Both teams to score).